So, there's this old philosophical concept of the Music of the Spheres, right? The idea holds that celestial bodies are part of a grand, unknowable symphony. Which might explain why everyone hums in the shower. Or not. Nevertheless, the great thing about Starbloom is how it makes you feel like you're creating planets and stars with just a sweep of your fingertip. Not only do you feel bound up in the Music of the Spheres while playing Starbloom, sometimes you'll get the sensation that you yourself are growing a miniature galaxy. 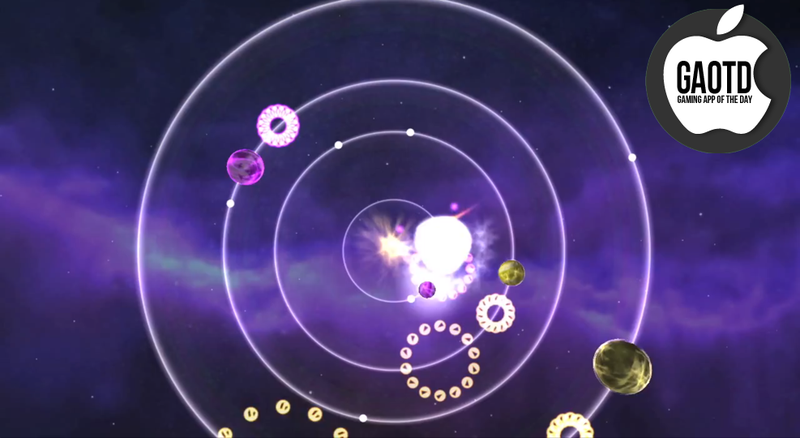 The mechanics in Shadegrown Games's iOS title are simple: each section presents you with rotating planets that pump out pulses of stellar matter, which you'll need to collect. Scooping up the cosmic dust spawns other planets which multiples the cycle even more. At the end of each system, you get told how many solar bodies you create, which is a snarky twist on a star rating. Power-ups streak through the screen in the form of comets and snagging them grants you tweaks such as invincibility or gravitational pull. The whole experience moves along a catchy electro-pop soundtrack that sonically morphs as you interact with the orbs from each planet. Starbloom isn't as simple as it sounds. Your score multiplier resets every time you hit a planet and as the boards get crowded with orbiting bodies you'll need to weave in and around them to grab as many solar motes as you can. The better you do, the more challenge you create for yourself. However, there's some sort of algorithmic sweet spot that keeps things from getting too hard to enjoy. Turns out being a space god is kind of relaxing and you get great music to do the whole let-there-be-light thing with.